Oooh we are having fun at 2 Sketches 4 You because we are looking for another person to join our Design Team! That honor will be awarded to the lucky winner of Card of the Week and all you have to do to possibly win is make a card based off of this weeks sketch at 2S4Y - super easy huh! This is my card based off of my sketch - I had fun putting making it because it was one of those rare moments for me where the idea, card and excecution thereof came together rather quickly. It seems it was the right product at the right time for this quick-n-easy card - gotta love it when that happens! Now Cath at Moxie Fab World has a bunch of challenges going on to celebrate Card Style which I want to participate in and I think this card fits in nicely with her challenge: Card Style: Let's do Fun & Cute. Others that caught my eye are the graphic, shabby chic and elegant challenges so I guess I am going to be busy! Have a wonderful week and try to stay cool out there! Definitely fun and cute, Kazan! I love those flowers...they make me happy! Love it...the flowers are fantabulous! It's wonderful, super fun, super cute and I simply adore those little lady bugs!!! Oh, i loooove this card. Maybe one of the best, you've made. Love your card! Thanks for the great inspiration... as allways! This is very pretty, Kazan! I love the pretty flowers and all the fabulous layers! Great job with the Moxie Fab challenge!! I need some help from you though... an it is kind of urgent. Could you tell me what you use for the big scallop borders? Is it a Spellbinders die? Thanks for being such an inspiration. And for the lovely sketches at 2S4Y. Thanks for an awesome sketch this week...love what you did with it! This is so cute and fun! Love it! This is too cute! Love your cards as always! Hey Kazan! 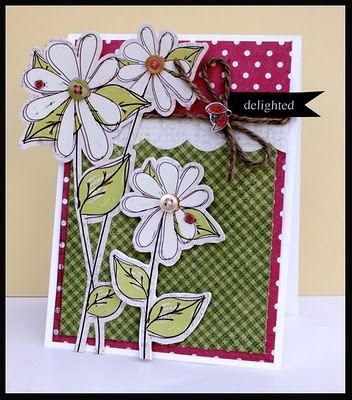 Thanks for entering the Let's Do Fun & Cute Card Style Week challenge in the Moxie Fab World! I'm so glad you joined in on the fun! Eeeek! I can share the surprise! You can have your Cake Shoppe!